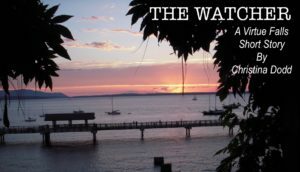 Settle down by the campfire and read THE WATCHER, a stand-alone Virtue Falls short story. Buy it for $1.99, or download it free when you join my mailing list! Don’t have an e-reader? 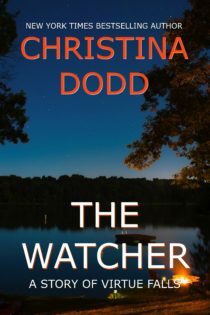 Download a free app, such as the Kindle app or Nook app, to read THE WATCHER on your phone or computer. Every time Sheriff Kateri Kwinault drove past the "Welcome to Virtue Falls" sign, she grinned. If Virtue Falls was world famous for anything, it was for an earthquake, a tsunami, and some very messy, well-publicized murders. And if she was famous for anything, it was surviving the earthquake and tsunami and recovering enough to be elected sheriff in a race so close she still got lip from every old fart in town. Not that they wouldn't have given her lip if she'd won in a landslide. The old guys in this town gave everybody lip, especially a female, half-Native American sheriff. Apparently that was part of the Old Fart Code. Sheriff Kateri Kwinault's cell phone rang; she glanced at the car screen and pulled over to the curb. In Virtue Falls, a town of eccentrics and loners, Rainbow Breezewing was the undisputed wise woman, and she always required all of Kateri's attention. "What's up, Rainbow?" Rainbow whispered, "I want you to come to the Oceanview Café and arrest the Rosen kids." "What did they do now?" "Whatever works. You didn't really call me to complain about the Rosen kids, did you?" "No." Rainbow's voice got grim. "There's a situation at the camp on the reservation." "The boys' and girls' camp?" "It's the only one out there." "What kind of a situation?" "Come on over. You can help me clean melted Velveeta off the metal napkin holders and I'll fill you in." Join my mailing list to get this short story free, and for book release news, contests, and fun!